Margarita Macias of the Rotary Club of Guadalajara Chapultepec stands with the heavy-duty washing machine donated by the Port Orchard Rotary Club for Albergue Mano Amiga cancer shelter in Guadalajara, Mexico. The machine, one of three funded by individual Rotary Clubs in Washington state and California, plus the water pressure system at right, launder clothing and bedding at the three-story hospice for impoverished cancer patients as they undergo treatment at a nearby government hospital. GUADALAJARA, Mexico -- More than 80 impoverished cancer patients have cleaner clothing and bedding thanks in part to members of the Port Orchard Rotary Club. 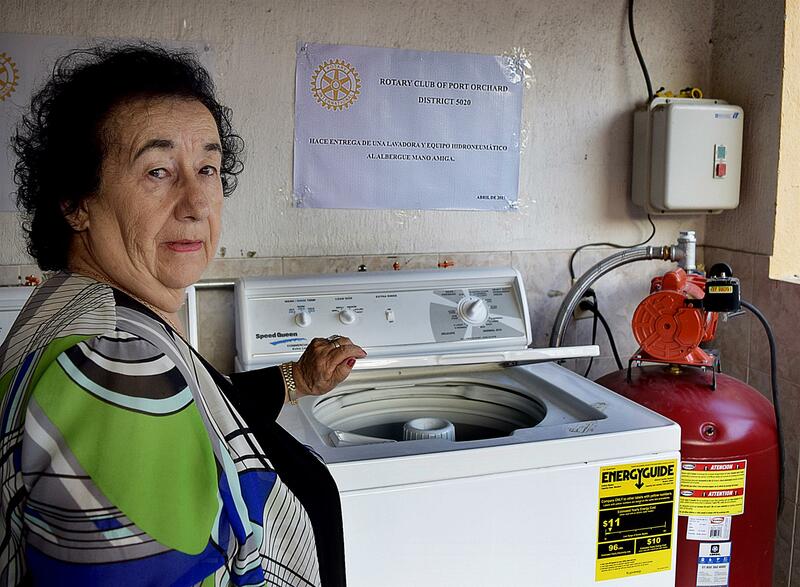 Through a $1,000 donation to answer a plea by a Rotary Club in Guadalajara, Mexico's second-largest city, an industrial-sized automatic washing machine has replaced two worn-out home-style machines. The Speed Queen-brand machine and two others purchased through like donations from two California Rotary Clubs serve Albergue Mano Amiga, which provides housing so that impoverished cancer patients from throughout western Mexico can undergo government-provided medical treatment at a nearby hospital in the picturesque central portion of Guadalajara. The government doesn't provide housing for patients, many of them Huichol Indians who must travel from their 16th century mountain villages hundreds of miles away. The 29-year-old, three-story Albergue Mano Amiga (loosely translated as "hand of a friend shelter/hospice") feeds and houses the temporary patients and their helpers at no cost through a nonprofit association created by its founder, an oncologist who is also a Rotarian, according to its website, www.alberguemanoamiga.org. "Each patient comes with an adult who can take care of him or her," said Margarita Macias, past president of the Rotary Club of Guadalajara Chapultepec who oversaw the washing machine purchases. "The shelter provides beds for two, plus bedding, three daily meals, medical, mental and spiritual attention according to the needs requested, and social activities." Rotary Clubs in Washington state and California donated funds to introduce automatic washers at Mano Amiga in 2002. Before then, the cancer patients and their helpers scrubbed their clothing and bedding on washboard-style sinks called pilas in the third-story laundry room, Macias said. The original four washing machines gradually wore out from the near-daily use, causing the Rotary Club of Guadalajara Chapultepec (Rotary District 4140) to contact a retired U.S. Rotarian who now lives in the Guadalajara area, Rex Wilson, to help recruit Rotary Club donors. Wilson, a past club president and district chairman who formerly lived in Port Angeles, contacted another former Port Angeles Rotarian, Dave Weikel who is now a member of Port Orchard Rotary (District 5020), who coordinated the donation. The other two donating clubs were recruited by District 5130 international chair Dale Ann Knight of Petaluma, Calif.
Now members of the Chapultepec Guadalajara Rotary Club , Wilson and his wife, Olga Murúa, who owns a retail business in the Guadalajara area, donated funds to provide the water-pressure system needed to power the three top-loading washers. "Essentially, they're coin-op laundry machines without the coin slots," Wilson said. "The pressure system augments the gravity-fed water storage tanks." Each washing machine carries the name of its donor club in perpetuity. "It's a great example of how a relatively small amount of international-service money from a U.S. Rotary Club goes a long way to help people in need around the world with something as simple -- and basic -- as clean laundry." Rotary International has 1.2 million members in 35,000 clubs worldwide that provide local and international projects and humanitarian assistance guided by the motto "Service Above Self." For more information about Rotary, visit www.rotary.org.